For this guide on our top picks among full size air mattresses, we looked at 34 products. The results you’ll see below are based on our in-house testing and rating in 4 quality categories plus the category of “user satisfaction” which represents the pool of data we gathered from 10.000+ user reviews from every corner of the internet. We think it’s accurate to say that this full-sized air mattress is fairly young. When we say “young,” we mean that it was introduced to the market in 2016 and it’s currently not only the top-rated in this size category but also one of the 3 best airbeds overall. What makes it different is, above all, the material used to make it and the inner design of the air coils. When it comes to materials, the industry standard is 0.4 mm vinyl. Now, if all the materials were the same, we’d see the same quality and results in terms of durability, air leaks and air retention. It’s also known that the most commonly used type of vinyl is one-layer recycled vinyl. Not with this model. The vinyl used here is virgin and layered with a nylon-encasing to make it more durable. This is one of the models with top ratings in air retention and durability. What we’ve seen is a very low number of developed leaks (top 5%) of all the models we tested. Is it right for you – main PROs and CONs? This might be the choice for you if you are looking for reliability above anything else. It’s one of the most durable airbeds out there. It’s also the right choice if your definition of comfort is firmness – that makes it a good choice for people with back pain issues and those on the heavier side. On the CON side, if you are used to a soft sleep surface, like memory foam, you might find it too firm, especially if you use it without the bamboo cover. You can see what people who are using it today are saying and compare price using the links below. Because it’s the single toughest model on the market. The weight capacity for the Queen is 750 lbs, we know of no other model that goes as high. It is the only product that significantly deviates from the standard of material thickness. Every once in a while we come across a model that uses thicker materials for the bottom to increase durability, but that’s not what we’re talking about here. The concept is simple – Fox simply made this one using 0.66 mm thick vinyl, instead of the 0.4 mm. For the owner, this means that it feels different than most inflatables. It’s more stable, sturdier and feels less like an airbed and more like your regular mattress. On the other hand, what makes it comfortable are the extra air-flow chambers added to the top. They’re there so that the weight is evenly distributed, but also act as an extra layer of insulation and cushioning, a topper of sorts if you will. One of the top “value for money” beds we know. It’s thicker and stronger, and yet, not more expensive. The pillow-top chambers even out the sturdiness of the material, making it more comfortable. On the CON side – the thickness of the material adds a bit of bulk which means it doesn’t pack as small. It does feature an extra valve for manual inflation, but for campers, it’s only an option if you’re driving to the site. The 3rd pick up the full-size category comes from Simply Sleeper. It’s one more model that is not your classic run-of-the-mill product and, again, the difference is the material. It’s 3 layers of what the company calls “air-tight” materials. To be fair, they describe it as “puncture-proof,” but we’re not a fan of the term and rarely use it in our reviews, since it’s relative, it doesn’t say much, and pretty much every company will use it to describe their products. 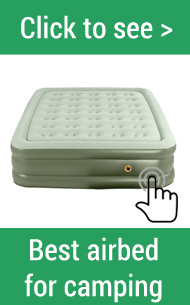 However, we can say that Simply Sleeper has earned the right to call it that because its’ one of the top 7% in terms of air retention and puncture resistance among the 100+ airbed we reviewed so far (counting all sizes). To put it simply, what makes the most difference is the finish material. It’s not the only bed out that features a “layered” design, but instead of the classic vinyl finish, this one is made of Durmothane PVC. To explain it better, it doesn’t have that “plastic” feel, but the finish is more similar to that of a, say, backpack. The pump is built-in, it inflates the bed in about 3 minutes, but more importantly, it’s a one-piece. It means that it’s not assembled from dozens of components. This makes a difference because one of the few main cause of air leaks are those that develop around the pump. Its main advantage is the balance between comfort and durability. To make an inflatable more durable, companies usually go with sturdier inner coils of thicker materials. The SS-58RF is at the sweet spot between the two – because its durability is balanced by the top-surface chambers that make it loftier. On the CON side – it might be worth mentioning that while new (first 5-6 uses) the material tends to make a squeaky noise against some floor types when you turn. After the first few uses, the noise gets milder and goes away fairly quickly. We first compiled this guide about a year ago – over that period, we’ve seen certain questions about pop-up over and over, so we’ll try to cover all our bases in the FAQ section below. The weight limit for the full size – we didn’t find one number that’ specifically listed for the size, but the listed weight capacity for the twin is 300 and for the Queen and King, it’s 600. We’ve seen no problems while testing it with a 450 lbs burden and we didn’t see a significant % of user complaints for that weight range. Do bear in mind, however, that 450 is our approximation based on the years of experience we have with similar models and doesn’t company directly. Also, the capacity of 450 lbs is for two people. If it’s one sleeper, that means more stress on the seams and more sinking to the middle, so we can’t say with confidence what the capacity would be in that scenario. It certainly is 300+ lbs, since that’s listed for the Twin XL. How comfortable is the provided topper? Can I use it with extra sheets? The topper holds very well. It’s designed with the exact dimensions and surface of this model and it snuggly “hugs” the top surface. We’ve seen no significant problems when used with an extra set of fitted sheets. What we mean by “problems” here is the potential issue of the sheets slipping from the surface. Can I use it for camping? It comes with a pinch valve and can be inflated using a manual or a leg pump. Those two features are there to make it more versatile and make give you the option of using it outdoors. Add the fact that it’s made of the mentioned nylon-reinforced vinyl (which means it’s less likely to be punctured and you have one of the few models out there that’s a solid choice for both indoors and outdoors. What we especially liked about it is the fact that other models that are this sturdy are usually simply made of thicker materials, which means they are heavier and bulkier. Weighing less than 20 lbs, it’s in the same weight range as similar models that are intended for home use only. Yes. And this is a common question with a good reason. We’ve seen many models that are a peg shorter or narrower than the listed size. This one is true to the listed size. How big is the carry bag? Our measurements show that when deflated and packed into the carry bag, the dimensions are approximately 17.5 “ (height) and 14.7 “ (diameter). Compared to the models of similar weight, it packs a bit smaller and narrower, which speaks about the fact that it’s performs well in terms of full deflation. We’ve seen models that tend to hold a bit of extra air and not deflate fully, which makes them more difficult to pack and store. Are then other color choices for the bed and the skirt? No, it currently only comes in blue (the bed) and white (the bamboo topper and skirt). What about smell and odors? After unpacking and airing it out for a bit, we’ve seen no significant off-gassing and little to none rubbery or plastic smells. We also haven’t seen a significant % of complaints to report back while compiling the data for this review. How to clean the topper? Can it be machine-washed? Yes, the topper can machine-washed on “cold.” We have seen no shrinkage that would be a problem for using the topper after washing it. How long does it take to inflate-deflate? It takes about 3 minutes to fully inflate and deflate. The number is not a set in stone because there is no auto shut-off function and it’s up to you to choose the firmness and turn the pump off. Does the pump come with an auto shut-off? No, you control the level of firmness by manually shutting the pump on and off. We’d recommend deep-pocket fitted sheets of the same size as the bed or a size up. The elastic band of a fitted sheet will keep it safely in place. Yes, it comes with a 90-day warranty. We mystery-shopped with Fox a few times already, basically every time we need to re-test and update our reviews and the customer service was responsive and fairly fast each time. Usually, they addressed the issue within a day. Is there a remote for the pump? No, the pump is a classic A/C, built in and there is no remote. It both inflates and deflates the bed and, in our tests, both were done in under 4 minutes. Do bear in mind that the pump is more powerful than with most similar models. This is factor if you want to use a power-converter. The description mentioning the words “pillow-top” can be confusing because people assume that it might include some form of foam on top. It doesn’t. Pillow-top refers to the shape the air-flow chambers. There is, however a version of this Fox that comes with memory foam – you can see it here. What’s the power of the pump? The pump is 105 Watts (to be used with 110 V outlets). To use it with a different outlet, you’ll need a converter. Can the pump be used with batteries? No, it’s a classic electric pump. What size sheets should I use? We’d recommend going a size up – for example, for a full size air mattress we’d go with deep-pocketed fitted queen sheets. Because of the specific material, sheets tend to slip of with classic sheets. The warranty will vary depending on the seller. If not clearly stated by the seller and you get it online, it will come down to the default policy of the retailer. We can say, however, that what we’ve most often seen with SS-58Rf is a 1-year limited warranty. What if I’m seeing air leaks? It’s common for an inflatable to have an impression you got a leaky one if you are making a conclusion based on a few nights. Even though the material of the SS58-RF is not as stretchy as that of most similar models, you might see some loss or firmness over the first few nights. Once the material “sets”, it will stop. In practice, this means that you might need to add air once or twice the first time you use it. Again, one more common issue with low-tier models are edges that are not sturdy enough and you might feel like sleeping on a balloon. The top surface of this Simply Sleeper is designed to address that. The edges are slightly raised (about 0.25 “). It’s small touch but it does add a bit of comfort and sense of security. This part is especially important for the elderly, because it getting in and out can be an issue if the edges are not sturdy enough. Is it cold to sleep on? It’s physics 101 that any inflatable tends to pull heat away from your body. That’s what people describe as “being cold to sleep on”. Here’s what happens. Micro currents of air distribute energy throughout the chambers. The more air movement, the more likely it will feel cold. Inner structure of this full size air mattress is oval coils. These coils limit the air movement, which is why we’ve seen better ratings in “temperature isolation” (the temperature isolation ratings are included in the comfort rating). Having said that, it’s still air and will pull some heat away if you sleep on the surface directly. It’s not a significant issue if you use a topper with sheets. If you use only sheets and feel that rushed of cold air, a simple solution like a blanket underneath the sheets might do the trick. What if I have a cat? The SS-58RF if one of our picks in the category of “cat-proof” air mattresses – you can see the full list here. The material is more resistant to claws than standard vinyl. How big is it when packed? The pump performs well in terms of deflation, which means that all the air is pulled out and the bed fold up pretty compactly. Our measures say that, when folded, it’s about to 14.5 inches (tall) and 10 inches in diameter. What’s the weight capacity for the full size? The maximum weight for the SS in both full and queen size is 600 pounds. What’s the gauge of the bottom? The bottom side is made of Polyester – to be more specific it’s 210D with a gauge of 0.48 mm. Can I use it outdoors? In theory, yes. Bear in mind that the pump is not standalone and it does need power to run. It can be used with a car-outlet…you will need a power-inverter. There is no secondary valve to inflate it manually or by using a leg pump. Our recommendation is that, if you are using the car outlet, to do it while the motor id running. Otherwise, you might drain the power of the car-battery. With that said, the good side is that it holds air very well. This means that if you have access to power, you’ll only need to inflate it once and the risk of it loosing air is lower than 95% of models we reviewed. What’s the material of the top surface? Unlike most models, the top has the same finish as the sides. On the plus side, this makes it more durable. For some people, however, this will not be an advantage, especially if you are used to a flocked, velvet-like top. Our recommendation is to use it with a topper and fitted sheets.